Sure to become a holiday baking tradition, these 3D Reindeer & Sleigh cookies can easily be made with our 3D cookie cutter sets (please view at http://www.fancyflours.com). Bake each piece separately, then decorate and put together with royal icing. We used our “Perfect Gingerbread” recipe, but our “No Fail Sugar Cookie” recipe would work great as well! Make sure cookies are completely cooled before decorating and putting together. The possibilities are endless for decorating these adorable cookies. 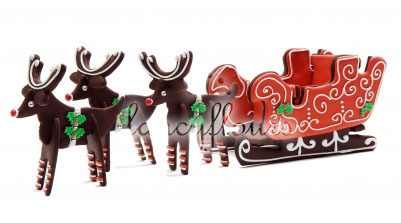 Use sugar whimsies to adorn the sleigh or red edible pearls for Rudolphs nose. Let your creativity go wild!